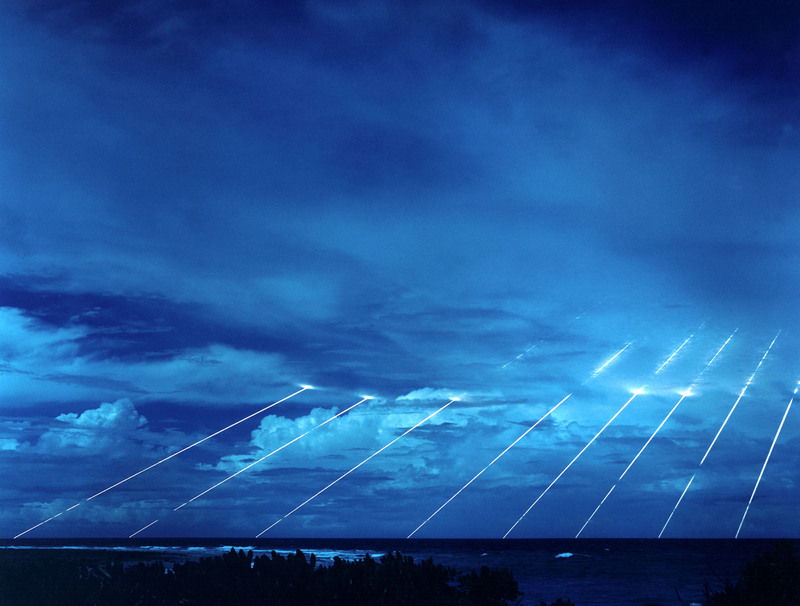 A multiple independently targetable reentry vehicle (MIRV) is a ballistic missile payload containing several warheads, each capable of hitting one of a group of targets. By contrast a unitary warhead is a single warhead on a single missile. Providing greater target damage for a given ballistic missile payload. Radiation (including radiated heat) from a nuclear warhead diminishes as the square of the distance (called the inverse-square law), and blast pressure diminishes as the cube of the distance. For example at a distance of 4 km from ground zero, the blast pressure is only 1/64th that of 1 km. Due to these effects several small warheads cause much more target damage area than a single large one. This in turn reduces the number of missiles and launch facilities required for a given destruction level - much the same as the purpose of a cluster munition. With single warhead missiles, one missile must be launched for each target. By contrast with a MIRV warhead, the post-boost (or bus) stage can dispense the warheads against multiple targets across a broad area. Reduces the effectiveness of an anti-ballistic missile system that relies on intercepting individual warheads. While a MIRV attacking missile can have multiple warheads (3–12 on United States missiles and 3-10 on Russian), interceptors may have only one warhead per missile. Thus, in both a military and an economic sense, MIRVs render ABM systems less effective, as the costs of maintaining a workable defense against MIRVs would greatly increase, requiring multiple defensive missiles for each offensive one. Decoy reentry vehicles can be used alongside actual warheads to minimize the chances of the actual warheads being intercepted before they reach their targets. A system that destroys the missile earlier in its trajectory (before MIRV separation) is not affected by this but is more difficult, and thus more expensive to implement. Cause the maximum amount of damage using the lowest number of missiles. MIRV land-based ICBMs were considered destabilizing because they tended to put a premium on striking first. The world's first MIRV—US Minuteman III missile of 1970—threatened to rapidly increase the US's deployable nuclear arsenal and thus the possibility that it would have enough bombs to destroy virtually all of the Soviet Union's nuclear weapons and negate any significant retaliation. Later on the US feared the Soviet's MIRVs because Soviet missiles had a greater throw-weight and could thus put more warheads on each missile than the US could. For example the US MIRVs might have increased their warhead per missile count by a factor of 6 while the Soviets increased theirs by a factor of 10. Furthermore, the US had a much smaller proportion of its nuclear arsenal in ICBMs than the Soviets. Bombers could not be outfitted with MIRVs so their capacity would not be multiplied. Thus the US did not seem to have as much potential for MIRV usage as the Soviets. However, the US had a larger number of SLBMs, which could be outfitted with MIRVs, and helped offset the ICBM disadvantage. It is because of this that this type of weapon was banned under the START II agreement. However, START II was never ratified by the Russian Duma due to disagreements about the ABM Treaty. Minuteman III MIRV launch sequence: 1. The missile launches out of its silo by firing its first stage boost motor (A). 2. About 60 seconds after launch, the 1st stage drops off and the second stage motor (B) ignites. The missile shroud (E) is ejected. 3. About 120 seconds after launch, the third stage motor (C) ignites and separates from the 2nd stage. 4. About 180 seconds after launch, third stage thrust terminates and the Post-Boost Vehicle (D) separates from the rocket. 5. The Post-Boost Vehicle maneuvers itself and prepares for reentry vehicle (RV) deployment. 6. While the Post-Boost Vehicle backs away, the RVs, decoys, and chaff are deployed (although the figure shows this happening during descent, this may occur during ascent instead). 7. The RVs and chaff reenter the atmosphere at high speeds and are armed in flight. 8. The nuclear warheads detonate, either as air bursts or ground bursts. The precise technical details are closely guarded military secrets, to hinder any development of enemy counter-measures. The bus' on-board propellant limits the distances between targets of individual warheads to perhaps a few hundred kilometers. Some warheads may use small hypersonic airfoils during the descent to gain additional cross-range distance. Additionally, some buses (e.g. the British Chevaline system) can release decoys to confuse interception devices and radars, such as aluminized balloons or electronic noisemakers. The Trident system contains cameras which are able to photograph the stars which allows them to have an accurate location system which is independent of radio communications. Therefore even with radio communications out of action the individual missiles are able to guide themselves. Accuracy is crucial, because doubling the accuracy decreases the needed warhead energy by a factor of four for radiation damage and by a factor of eight for blast damage. Navigation system accuracy and the available geophysical information limits the warhead target accuracy. Some writers believe that government-supported geophysical mapping initiatives and ocean satellite altitude systems such as Seasat may have a covert purpose to map mass concentrations and determine local gravity anomalies, in order to improve accuracies of ballistic missiles. Accuracy is expressed as circular error probable (CEP). This is simply the radius of the circle that the warhead has a 50 percent chance of falling into when aimed at the center. CEP is about 90–100 m for the Trident II and Peacekeeper missiles. ↑ Robert C. Aldridge (1983). First Strike! : The Pentagon's Strategy for Nuclear War. South End Press. pp. 65–. ISBN 978-0-89608-154-3. http://books.google.com/books?id=x__CgnLTLqkC&pg=PA65. Retrieved 26 February 2013. ↑ Cimbala, Stephen J. (2010). Military Persuasion: Deterrence and Provocation in Crisis and War. Penn State Press. p. 86. ISBN 978-0-271-04126-1. http://books.google.com/books?id=rMe9guZoyIUC&pg=PA86. Retrieved 3 May 2013.